I’m away for a few days… Going to the megatropolis (kidding) of Regina, Saskatchewan for the 50th anniversary of my aunt and uncle. Dad’s younger brother. Should be fun as all my cousins are going to be there. When I return on Monday, I’ll have my 8 year old neice in tow… She’s attending “Camp Auntie Maureen” for a while–as my sister likes to call it. So, with entertaining an 8 year old and all… not sure how much blogging is going to happen. Thought I would tide you over with a few snaps from the conference! 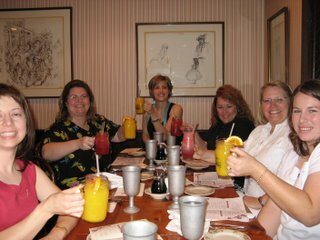 Just a few of the Chick Lit chapter writers who have sold or had a book come out this year. Chick lit didn’t look dead that night! Aryn our wonderful and brave president congratulates Lois Winston, Diana Peterfreund, Nadine Dajani and Marley Gibson. (Nadine, Diana’s right… get that web site up!) Congrats girls! Thurs night, I tagged along to a Florida/New England dinner at Aunt Pitty Pats. Amazing food. Even more amazing fun. Too bad I didn’t frame this better. Sorry Kelly! Cheryl is holding my drink, the red one, which was called an ankle breaker. The menu didn’t have a description of the ingredients, just a testimonial that some general or other had broken his ankle after drinking a few. Luckily, I only had one and my ankles stayed in tact–barely. Thanks to our great waiter for selecting the drink for me. I told him to surprise me. Would love to post a few more snaps, but a car is coming to take me to the airport in an hour and I still have to vaccuum my bedroom, make the bed, finish packing and shower. YIKES!!! I am the Queen of Last Minute Land.